We all know that improving our gut health is important especially for women with endometriosis. Research has shown that endometriosis almost certainly includes some degree of autoimmunity so keeping our immune system as healthy as possibly and thus keeping inflammation at bay is key. 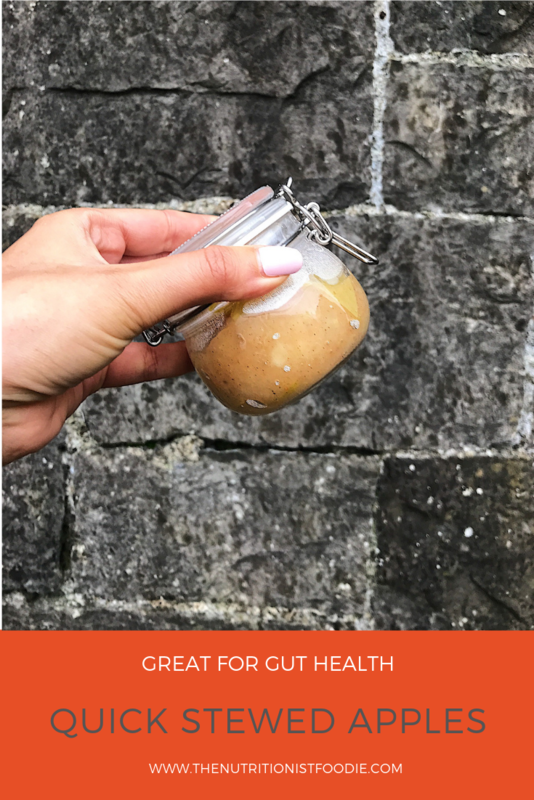 Probiotics are basically live good bacteria and we get these in foods such as live dairy and fermented foods like kefir, kombucha and saurkraut. These are amazing foods but they can be quite difficult to get into our diets on a daily basis. Which brings us to prebiotics. Prebiotics are food for our existing good bacteria. These are usually fibrous carbohydrates which are much more easily incorporated into our diets. Apples are a great prebotic source and are easily included in our diets…which brings me to this simply and delicious recipe which can be easily knocked up in less than 20 minutes and is a great addition to things like porridge, greek yogurt and even can be made into a healthier crumble. Leave to cool and put into a kilner jar. It will keep in the fridge for about a week. I’d love to know if you tried this and what you tried it on? What foods do you include in your diet to improve your gut health? Would you like an article on other probiotics you can include in your diet?